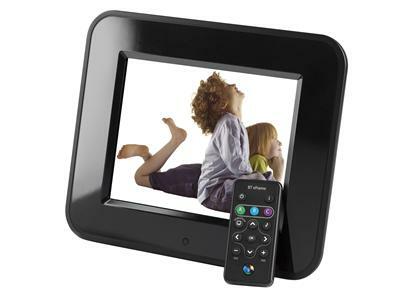 Having disposed of my Philips photo frame, I have purchased a BT eFrame 1000 wireless 8″ digital photo frame from dabs.com – for the remarkable price of £63.60. The photo frame supports 802.11g Wi-Fi for file transfer which I am keen to give a try. As usual, the supplied management software will only run on Windows platforms (I tried Crossover on the Mac, but it doesn’t quite work). I sent a speculative email to the BT Product Helpdesk to enquire about the availability of technical specifications for the file transfer mechanism, however I have not received a response. I then discovered from the CE Declaration of Conformity that the device is actually manufactured by Quanta Microsystems, Inc (QMI) and badged as BT. I read somewhere that QMI’s vanilla device supports the FrameChannel service but this feature has sadly been removed from the BT firmware. In an attempt to get my hands on the vanilla firmware I found a contact at QMI and pestered them for more information. They are staying tight-lipped and won’t divulge anything useful, so I am stuck without a solution for Mac OS or Linux. Undeterred I am going to do it the hard way and embark on a mission to reverse engineer the proprietary protocols that control this device and hopefully open-up the full potential for non-Windoze users. This entry was posted in Reviews, Techie by djh. Bookmark the permalink. Just got one of these myself and have been surprised by the lack of reverse engineering efforts so far!